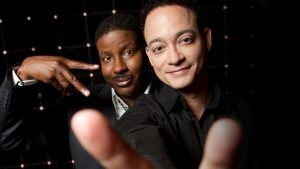 recorded on Sultra Records By 1987 they had changed their name to Kid ‘n Play. with the low top fade regularly wore unique custom made jackets. Johnson, Robin Harris, Bernie Mac, Chris Tucker, TLC, Queen Latifah and many more. haircut was used as a plot device in the film. Service PBS math show ”Square One TV]’ and ”Sesame Street’. Time” and the Martin Lawrence sitcom. film, digital, and live productions. short and full-length multimedia projects. Central University and Healthy Start Academy Charter School. New England University to name a few. pop and R&B icon and pioneer Kenny Gamble (Sounds of Philadelphia Gamble & Huff). became and celebrated as one of the top ten episodes of all times of 100 episodes. The 90’s” tour and individual dates around the country.